As part of an event for ‘Supporting Researchers at Edinburgh Napier University‘ I’ve been asked to put together some resources and reflections on the ways blogs and blogging can play a part in the life of a humble researcher, such as me. Rather than produce some slides for my twenty minutes in the spotlight I’ve bundled a collection of links into this blog post. Please post questions, suggestions and more connections in the comments below ??? particularly if you’re in the audience for the talk. When I created the blog in the summer of 2010 I decided I was primarily writing it for myself. I wanted to have a space for my thoughts, somewhere I could write and publish work on a variety of topics and be able to find it later. Rather than keeping it to myself I also saw it as a space in which to have a presence online, but somewhere I could control rather than having to abide by the rules of Facebook or another comprehensive social media platform. It is important to me that my blog is open to anyone with an internet connection and isn’t locked up in an online walled garden. I spent a small amount of money buying a domain name to suit me (www.davidjarman.info), but this isn’t compulsory by any means. I’ve been happy with the blogging platform I use (Posterous), but as they’ve since been bought by Twitter there’s a degree of uncertainty about the future. At times my attitude towards using the blog is ?? ?sharing by default??? : if I attend an event I might automatically write a post as my way of recording what happened, which is then shared with the world. I don’t see my work as being commercially sensitive, although I know of other researchers who wouldn’t consider publicising what they’re doing ??? perhaps they’re contractually obliged not to! At the back of my mind I ask myself what my students, employers and parents might think of the things I write and publish, whether it’s for the blog or on Twitter. In my experience it doesn’t tend to take long for new users to get used to the cultural norms of conversation and sharing on a given social media platform, but if you?? ?re not familiar then it?? ?s advisable to spend time reading and observing before jumping in. I don’t think I make full use of the tools available: I don’t blog often enough, rarely dip into organised Twitter conversations (such as #PhDchat) and could do more with video and audio to liven up my corner of the web. But I enjoy it nonetheless and am very glad I’ve got an easily accessible record of my PhD progress thus far. This entry was posted in Posterous transfer and tagged conference, napier, software, twitter on 02/12/2012 by David Jarman. Over the course of the London 2012 Olympic Games I put together a Storify of tweets relating to the events and the debates and the media stories that people were linking too. It wasn’t systematic process, there’ll be lots that slipped through the net and this is a manual compilation without the aid of APIs or other labour saving devices. …and at the time of writing finishes with a link to Fatima Whitbread’s comments on whether the Games will really ‘Inspire a Generation’. This entry was posted in Posterous transfer and tagged livesites, napier, olympics, phd, software, twitter on 17/08/2012 by David Jarman. 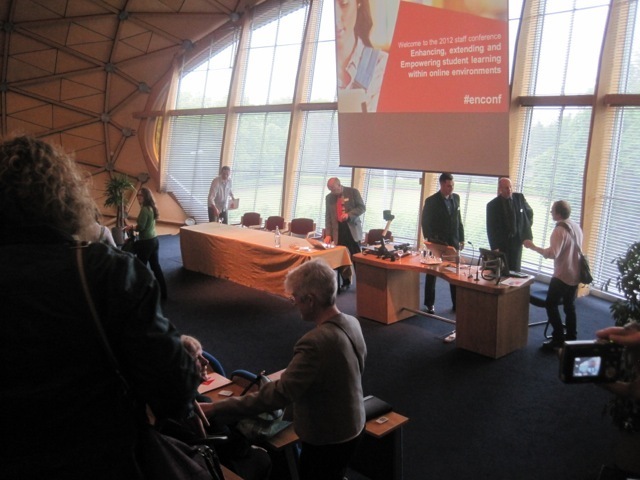 Edinburgh Napier University, my employer, hosts an annual conference for academic and professional services staff – an opportunity to get people together, focus on chosen themes and discuss ways of integrating them into our teaching and learning. Technology is a recurring topic, as was the case on Friday 15 June with the title ‘Enhancing, extending and empowering student learning within online environments’. The conference site is here, with the ‘3E Benchmark Framework’ which underpins the university’s efforts in this area here (available for wider use under a CC licence). …with the first and third of those ideas eventually coming to fruition. A core of people attended the event knowing that we were going to use social media and were kitted up to contribute. For some that was a Twitter account on a smart phone, while others (notably two volunteers from our Masters in Event Management) were purposefully taking still photos and video footage for later use. As hoped for, there was also a large enough pool of type three ‘existing users’ who quickly started using the conference hashtag and got stuck into the debate online – expectations are such among some conference delegates that they will only wait so long to be told how to engage in that conversation before finding their own solution, so it was important that #enconf was publicised early and regularly. There was half a plan to have a pre-conference gathering of all those interested in using social media, where appropriate tools could be discussed, but in the end this didn’t happen and probably wasn’t necessary. Two main goals were set: to enable/facilitate an online discussion on the day; then find a way to capture this for future reference and dissemination to those who attended, and those who didn’t. Twitter was the basis of on-the-day discussion, with folk tweeting photos, links, questions and comments – this worked well. Capturing the day also used Flickr and YouTube to host the material from our students, with Storify acting as the basis of the final record of the day (as inspired by work like this from David McGillivray). A quick note on Storify to finish this post, quoting from their site: ‘Storify lets you curate social networks to build social stories, bringing together media scattered across the Web into a coherent narrative. We are building the story layer above social networks, to amplify the voices that matter and create a new media format that is interactive, dynamic and social’. It’s a doddle to use, enabling you to drag in pictures, tweets, videos and more into the order you desire. You can add text to help set the scene, guide the narrative and link topics together. And as with so much of social media these days it’s very difficult to come up with something that doesn’t look good. This entry was posted in Posterous transfer and tagged conference, napier, software, twitter on 17/06/2012 by David Jarman. It doesn’t become a conference to be too modest in its name, a little ambition goes a long way: future… everything! If it’s yet to happen this conference is interested. I’ve not been before, but I know of their work and didn’t dare pass up the chance to visit (exam marking would have to wait). I’m going to split the event into a different blog posting for each day, though I suspect this will result in some long posts and I may abort the tactic ??? there’s a lot to write about. I first sat in on a presentation from Jennifer Jones (@jennifermjones) all about #media2012 and related projects, though I’ve written about that elsewhere and I’m sure I’ll do so again, so I won’t go into detail here. The morning also welcomed a panel discussion about Mass Observation and how material should be archived in the 21st century: what impact does editing have, can it be limited, what will people be interested in in the future (we don’t know) and what part should be played by museums, archives, the BBC and Mass Observation themselves? Both of these sessions touched on themes of power and access: the relative power of mainstream broadcasters and regular citizens to tell their stories, such as those wrapped up in the Olympics as the biggest media event the world will have ever seen. Who are the gatekeepers to these media and these archives, and thence to their audiences, and what chance do citizens have of gaining a foothold to access such resources? Museums and archives can only display and hold so much material, while Facebook and other social media organisations will not be quick to open up their treasures to archivists. Meanwhile the BBC has a pretty clear idea of what its role is during these Games (and there’s more on that to come on this blog). Moritz Stefaner spoke about his work on data visualisations, a job he has styled to give himself the title ‘Truth and Beauty Operator’. So there. He talked us through the process of creating a couple of visualisations, which look stunning and were generally accessible as sources of information. As if to reaffirm a point made by Farida Vis at #enubs12 however, Stefaner also made the point that visualisations are good for the big patterns, but not so much the data points themselves… there are other ways of representing small data in greater clarity and detail. So how does that link to the next talk, from Caitlin O’Riordan and Ben Gallop of the BBC who talked about their work covering the London Olympics? They are wrestling with the need to cover the big events, to provide the mass moments when we all (possibly) come together, as well as enabling us to curate our own Olympic experience. The point was made that the Games are regularly catalysts for advances in media technology and practice; this year some 2,500 hours of sporting action will be available online in glorious HD. Choice phrase of the day also came from this talk when Gallop proclaimed that ‘We’ll be telling the truth about the Games’ …it’s just as well that Jennifer Jones was present to make the point that #media2012 can help them in that endeavour. Onwards, to building communities online around a real world cultural institution, which in Richard Ayers?? ?s case is Manchester City Football Club (@richardayers). Where Man City is viewed as a brand, as with many a football club it?? ?s one that you don?? ?t have to persuade people to engage with ??? there?? ?s a fanbase who want to know more about you, but the challenge now is about granting access. Ayers discussed the comparative success of providing behind the scenes video clips, which people loved seeing, against the poorly received ???bluffers??? guide??? to supporting the club ??? this didn?? ?t go down at all well with the fans. So an open access approach is now informing the club?? ?s strategy, one tailored to different groups of fans responding to differing degrees of detail and complexity. A digital journey was described that may start by ???liking??? the club on Facebook, then commenting on an existing post somewhere, moving on to tweeting about the club and over time engaging more and more deeply with the online community. Each person?? ?s place within that community is shaped by their own level of interest and knowledge, alongside the level of acceptance granted by the rest of the community: how long are your comments shot down and your contributions dismissed before you?? ?re accepted? This is the fans organizing themselves, much as they do within the stadium itself ??? perhaps starting their journey in the family section, moving round to the most vocal sections and onwards until they sit amongst fellow veterans talking about the good/bad old days. The discussion moved on to ask which cultural forms tend to generate tribal tendencies, from sports teams to film genres and activities such as food blogging. Where do these groups sit within the wider society and what are the implications for resource allocation to serve these sub-groups? What happens when that takes place alongside a desire to reach new markets, as Man City are trying to do in a number of places around the world? It?? ?s partly about meeting expectations and wholly to do with being culturally sensitive, which goes back to recognising the demands of different groups of fans and what they?? ?re after from a modern football club. Ayers finished his talk by pointing out that the executives who are funding and enabling the club?? ?s digital investment were once players out on the pitch??? it has taken a cultural shift for some to accept digital methods and become a ?? ?hybrid organisation???. To round off my first day at FutureEverything I greatly enjoyed the talk by Juha van?? ?t Zelfde on ?? ?The City and The City???. At its heart was the idea that we are recreating ideas of what cities mean to us as citizens, inhabitants, networked communities and people figuring out how to handle shifts in what notions of private and public actions mean. Juha is behind organisations such as Non-fiction (?? ?office for cultural innovation???) and VURB (?? ?policy and design research concerning urban computational systems???). The talk was partly a personal reflection, whether it be the evolution of the online availability of music or the rise of geolocation on the web through smartphones. It was also a recognition that ?? ?with all these technologies the notion of what my city is has changed??? ?? ?we don?? ?t lose touch with people simply because they move away from our city, instead technologies allow us to bring their experiences into our own world ??? their new home city becomes part of our lives and we exist in numerous places. To quote a couple of phrases: ?? ?a new kind of spatiality is senseable?? ?, because we live in ?? ?the continuous partial everywhere???. Juha asked what this means for the infrastructure of our cities, and what would we do now if we were to build our cities from scratch. What are the implications for individual objects, and what does it mean for whole societies and governments operating at a macro level? Do we become part of what?? ?s happening elsewhere because of our connections and what does that mean if we want to play a part in the governance and management of those locations? Perhaps our very notions of what a ???city??? is have to change ??? ?? ?there is another city: an informational one??? you are the city???. After 1,400 words on just a single day?? ?s activity I don?? ?t want to stretch this post out any longer in the search for connections between these speaker and my own work. Nevertheless it was pretty clear that the there are plenty of people working on the links between technology, community, networks, cultural identity, governance and the lived experience. If ever I?? ?m to find a conference/festival that brings together real life shared experiences and the virtual community this would surely be it, and yet to what extent did the people in the room have an attachment to the event beyond the short term coming together of people and ideas? Did they have a sense of ownership over it the same way cultural festivals gather an army of supporters? Just how important were the FutureEverything coffee breaks in forging a community spirit, or were they all about old fashioned networking and working out where to eat before going to see Metropolis? This entry was posted in Posterous transfer and tagged city, conference, networks, phd, twitter on 31/05/2012 by David Jarman. I’ve been soaking up quite a bit of social network literature recently as it is becoming the central theme in my PhD planning. As a focus for analysis it can often be found sharing space with discussions on social capital, yet the events literature tends to favour the latter – there is plenty of scope to consider the networks that exist around and between festivals and events. As Christmas readies itself to claim the hearts and minds of the nation for a day or two I’m using this post to aggregate a few links, tucking them away for future reference. 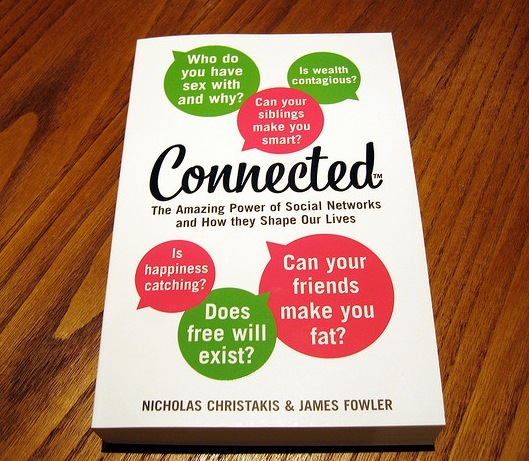 Nicholas Christakis and James Fowler’s excellent Connected (@connected_book) is required reading. Thorough, lively, full of great stories and keen to demonstrate that a better understanding of social networks may help us explain a vast array of habits, practices and cultural norms. Here are some links to their website and the book itself on Amazon.co.uk. Those with little to do over the festive season could fill some time looking through the array of videos, links and lecture slides on their site. If you’d rather some content to pick up on the go, here’s a podcast lecture from The RSA. Speaking of The RSA, a recent post – Networking by numbers – from Gaia Marcus (@la_gaia) on the RSA site flags up a current project ‘to measure the social impact of public services and civic interventions and to allow people to see their own personal networks’. As part of an empowerment agenda the plan is to move away from traditional forms of social research, with their attendant inconsistencies and problems, towards something more personal, verifiable and up to the minute. It is a project to keep an eye on. Moving the conversation closer to my preferred stomping ground of arts festivals, The Guardian has published a couple of pieces under the banner ‘Digital culture: hierarchy to network’: part one and part two. Written by Patrick Hussey of Arts & Business (@PatrickRiot) they feel like the very outer dermis of what he has to say, but they contain plenty of links to further work and projects. They are also a sign that the networking theme is now entering the mainstream of cultural management, gaining momentum as a topic demanding attention and resources. It also suggests some pretty solid foundations on which to build my own research in the months ahead. My recent PhD discussions and thoughts are focusing me towards trying to describe the social networks that exist around the production of a festival. The tools and the maths exist to make this possible, whether virtual or real. Where does power lie in these networks, how closely do they reflect the stakeholder maps that underpin the modern trend for partnership delivery, and what can festival producers do to support a healthy social community around their events? Taking this a step further, albeit a big step, what characteristics does a festival city like Edinburgh have – what are implications for individual events, the wider festival economy/ies and policy makers? This entry was posted in Posterous transfer and tagged networks, phd, thersa, twitter on 23/12/2011 by David Jarman. #EdTwestival: bringing it all together. Yesterday was Twestival, in cities across the globe. I’ve written about my involvement in Edinburgh’s Twestival before, so a quick follow up post is in order. The big numbers: over 300 people through the door and over ? ?5,300 raised for St Columba’s Hospice in Edinburgh. Fantastic stuff from all involved. As I said in my original post, I avoided much in the way of responsibility and just tried to help where I could. I took on the silent auction, which brought in nearly ? ?600, and tried to ask sensible questions along the way. It was great to see some Edinburgh Napier students volunteering too and getting stuck in on the night. I don’t have any profound ‘social capital’ related conclusions to draw from the night, particularly as I got little sleep last night and have eaten even less over the past few days. I can attest to the good feeling in the room and the floods of twitter-love that have been pouring in today. The event seemed to capture the sort of mood that people were looking for, giving them a chance to meet old friends, contribute to the fundraising pot and enjoy the music. Maybe it’s Twitter, maybe it’s modern life, but it sometimes feels as though social media has given us a way to construct big networks of acquaintances, with only a minority turning into deeper friendships ??? I’m sure I’m not the first to make this observation. What I saw at #EdTwestival however was that although people spent much of their time in established friendship groups, there was an open invitation for others to join in the conversation. I was floating around drumming up bids for my silent auction and no one seemed to mind me interrupting their conversations. There’s also been a lot of tweets through today of the ‘sorry we didn’t get to meet up’ or ‘it’s great to put a face to a Twitter name’ variety. The interplay of virtual and real communications is important to people and I wonder how this plays itself out for folk. I suspect that at one level people see Twitter and social tools as part of the ongoing flow of their lives: working, social and information gathering. But in order to try and make sense of that stream of information maybe they (we) rely on an internal map to tell us which signs to take notice of: the tweeters to listen to depending on our mood, the themes to watch out for, etc. (I also suspect this helps people tune out: I’ve spent most of my Twitter social capital by banging on about the event so much!) Back to the map: it’s a plan drawn out of experiences and connections, and I would hazard a guess that real life additions to the cartographic project count for more than virtual contributions. Is this a form of psychogeography, yet one that describes cerebral terrain rather than the physical? Some people’s capital stock has risen considerably: they have been active online during the planning, committed to the project and visible on the night. (I doubt anyone has suffered through connection with the project, they’ve just slipped under the radar perhaps.) The opportunities existed throughout the process to invest in your community and to see the community return their appreciation. Connections were made, relationships established and networks strengthened. What’s more everyone had a good time. Sadly however, there don’t seem to be any pictures on Flickr yet with a CC licence, so here’s @andrewburnett and @btocher from another event: the people, hat and possibly some of the clothing also featured at #EdTwestival 2011. This entry was posted in Posterous transfer and tagged city, edfest, networks, phd, twitter on 25/03/2011 by David Jarman.